Thank you to the following sponsors of the 2018 Families Learning Conference! The National Center for Families Learning’s annual Conference is the premiere event focused on innovative strategies and practices in family literacy and learning, two-generation education solutions, and parent and family engagement. 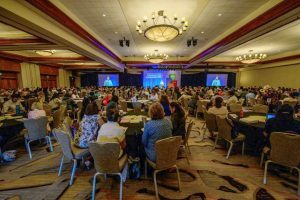 By becoming a sponsor of the Families Learning Conference, you’ll reach a national audience of approximately 1,000 educators, school leaders, literacy advocates and practitioners, researchers, and family engagement experts. From event sponsorship to exhibitor booths, we’ve got you covered. Whatever your budget, NCFL has an opportunity to match your needs. Be the brand that opens the 2018 Families Learning Conference with a splash! 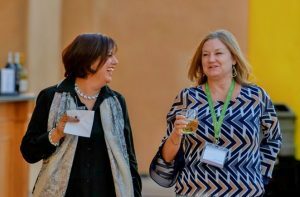 Attendees will kick off the opening night of Conference at a festive beach reception, with your company listed on reception invitations and one (1) complimentary guest drink ticket. See additional sponsor benefits in this sponsorship packet. Harness the excitement at NCFL’s Brunch ceremony by engaging Conference attendees in your brand at the Conference closing session! Sponsor has exclusive speaking role during the Conference finale event. See additional sponsor benefits in this sponsorship packet. Be the exclusive sponsor of the pre-Conference innovative learning session focused on early childhood. In collaboration with the Global Family Research Project (GFRP), formerly Harvard Family Research Project, and The Early Learning Lab (ELL), NCFL will host a partnership event for Conference attendees centered around family engagement and family service learning in early childhood, a huge draw for Conference-goers. This one-of-a-kind event, led by national field experts, will be a 4-hour active outdoor session using the tenets of design thinking and bringing Conference attendees together to brainstorm, interact, and actively participate in a powerfully engaging session. Be the exclusive Sponsor of NCFL’s exciting pre-Conference event, the MODS Happy Hour event on Sunday evening, September 23rd! In partnership with the Museum of Discovery and Science (MODS), up to 100 attendees will kick off Conference week with fun, hands-on activities outside on the Harbor Beach Marriott pavilion. Attendees will mingle and enjoy a complimentary drink while enjoying engaging activities and takeaways, such as the mobile planetarium, STEM table activities, and educator workbooks! Sponsor beverage stations during NCFL Families Learning Conference (Monday – Wednesday). Your company will be featured as the exclusive sponsor of beverage breaks on the website, on signage at the event, in the mobile app, and in the Conference program. Napkins with your logo will be placed at each break station. Allow attendees to unplug and plug in during the Conference! A popular addition to any event, Conference-goers flock to a place to charge devices with close access to sessions. Promote your brand while providing a valuable addition to the attendees’ experience! 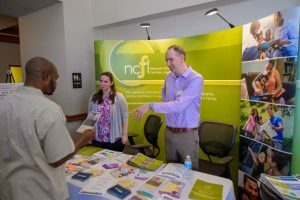 Your sponsor benefits include a special mention by NCFL President during Conference opening remarks, your brand’s recognition on digital signage throughout Conference, the ability to provide branded phone/tablet chargers for use during Conference, and physical and digital signage at Registration and at Charging Station. Your sponsorship also includes a designated exhibitor table for products or promotional items. Provide attendees access to powerful, expert-led educational content by sponsoring a Featured Session. Your sponsorship covers costs for meeting space, wireless internet, a screen, podium, LCD, and microphone for each session, as well as branded on-site signage and program recognition. Additionally, a designated representative from your organization may provide introductory remarks for the session. Sponsor may select featured session that aligns with company area of interest. Your company will enjoy prime placement in the main Conference breezeway, where attendee foot traffic is heaviest. You will have a 6-foot table with the ability to bring branded table covers, signage, and promotional giveaways and company information to share with approximately 1,000 attendees throughout Conference. Exhibit tables will have access to Wifi and electrical outlets, and include one complimentary registration. The application to become an exhibitor has now closed. Click to learn about specific opportunities for sponsorship.